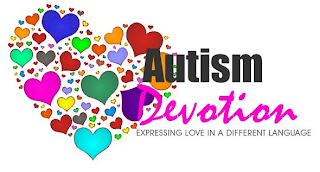 If you have been following this blog for a while you will know that my 5 year old Autistic daughter, "MissG", is off to school in a few weeks to attend Kindergarten in a mainstream class setting. We have been doing lots of preparation over the past 6 months (you can find posts on this topic by searching "transition to school" using the search function at the top right of the blog). You will also be aware that due to the NSW Governments cuts to disability support funding, and despite extensive efforts on my part and the part of The School Principal, she will not be entitled to any individual support funding. This is disappointing to me, as it was individual funding that made such a difference to my older sons success in Primary School, and because in MissG's case there is danger of her running away and hiding when she is experiencing stress or Sensory Overload. When I say "danger of", I mean she WILL run away and hide when she is experiencing stress or Sensory Overload ( for a bit more on Sensory Overload click here). Even after being made aware of this, the Department of Education still does not feel she has "high enough support needs" to warrant an allocation of individual funding. So it is left to the school and I to manage with no help. The School Principal, being the wonderful and supportive man he is, has assured me he will find money from his general budget to ensure MissG gets the support he needs. He is considering MissG's teacher allocation very carefully, as well as what classmates she will be best placed with. I cannot tell you what a relief it is to have such a professional, dedicated and compassionate man leading the team at my kids school! Were it not for people like him and his staff, mainstream schooling would not be an option for my girl, especially when the funding providers and policy makers at government level has such a disregard for kids with extra support needs. MissG's Psychologist and I have been working for some months now on helping MissG develop the skills she will need next year, both social skills and general coping strategies. Autism itself is tricky enough to manage in a mainstream classroom, but with the additional diagnosis of Sensory Processing Disorder in the mix, there are some extra challenges to prepare her for. As I mentioned, MissG will run and hide if she is stressed or experiencing Sensory Overload. The main strategy we have been working on is to help MissG learn to manage her need for sensory deprivation, or time out, in a safe way. Specifically, teaching her that it is OK to go and hide if she needs to, but she must hide in a designated "Safe Hiding Space" and only after informing a trusted adult that she intends to do so. This is not as easy as saying it once and her being able to do it from then on, unfortunately. Due to the nature of Sensory Overload, she will not always remember to communicate her intentions when she is in the moment of desperately needing some quiet to be able to re-establish her equilibrium. So- this is what we are doing. These are MissG's "Hiding Tokens". She likes dogs very much, and at her preschool there was a Golden Retriever who was a regular visitor that MissG had a special bond with. She finds the thought of this dog very calming. So we have used Golden Retrievers as the Image associated with her "Safe Hiding Space". MissG will wear a token on her clothes, clipped on with a clip she can easily manage to open and close herself. When she needs to get away and hide she is to unclip the token from her clothes and give it to a trusted adult (at home this is her Dad or I, at school it will be the nearest teacher). Once the adult acknowledge the receipt of the token, she is free to go to the designated "Safe Hiding Space". If it is not appropriate for her to do this at the time, the adult will need to have an alternative for her to use that is manageable- a distraction of some sort (lets go together and get a drink to help you feel better then you can tell me what is wrong), but it must keep in mind that she will be unlikely to be able to express what is wrong until she has had a few minutes (at least) to calm down. The designated "Safe Hiding Space" will display the same dog picture that is on the tokens. Here you can see the one we have set up at home on her bed. Also in the "Safe Hiding Space" is a toy dog that was bought for MissG by her preschool teacher. It is the same as her favourite toy dog at preschool, and is very special to MissG (I am planing to buy a few more of these next time I am at Ikea!!). You can see here the toy dog sitting on her bed, where it lives and waits to keep MissG company when she needs it. This picture shows what the "Safe Hiding Space" at home looks like when MissG is using it. It is just a curtain hung from the rail of the top bunk that when she wants to hide MissG can easily pull across to create a hiding space that she can sit in without anyone seeing her. When she has the curtain pulled across we all know she doesn't want to be disturbed or to have to speak. When she feels better she can come out, push the curtain back and come back to the adult she left the token with to get it back. This gives the adult an opportunity to ask her if she needs help with anything. Now, I need to point out that this is not a strategy that MissG needs to use every day. In fact, at the moment, she doesn't even need it every week. However, as hiding is a behaviour we have seen many times in the past, particularly during times of high stress, it would be foolish of us not to plan for it when we know she will be entering a period of high stress when she goes to school for the first time, probably in the same week as she is going to become a big sister for the first time! If we can help MissG learn to use this strategy well, it could very easily avoid an incident of the school staff "losing" her from the classroom or playground. It also helps MissG to learn about the importance of communicating her needs and about ways to keep herself safe. I still feel nervous about the run and hide issue, but we are doing all we can to help MissG with it. The school is aware and strategies are in place. Now we just have to hope for the best. 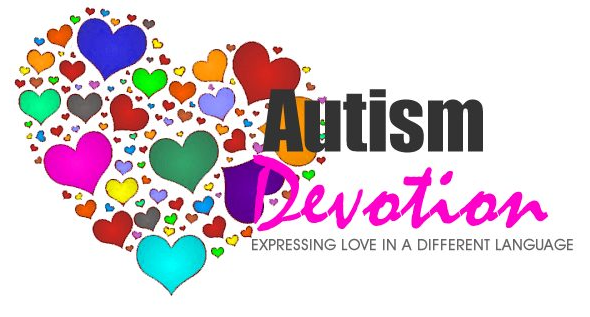 This month I'm joining with some Blogging Friends to contribute to creating a series of posts under the topic of "Autism Devotion....."
I'm going to start with "Autism Devotion to Helping"
At our place we have routines established around helping in the house that involve everyone participating in chores and keeping their own things organised so that we all have a roll in helping the house run smoothly and stay (sort of) tidy. From the adults to the youngest, everyone has a roll to play. That is not the kind of helping I'm going to tell you about. I'm going to tell you about how my Autistic kids show compassion by helping spontaneously when they see someone in need. One of my favourite recent memories was on a very rainy day when MissG and I were going to pick the kids up from school. 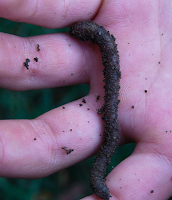 The ground was very wet in the playground and as we crossed over the paved quadrangle MissG noticed a worm on the ground. She stooped down to pick it up, and explained to me that it was very important to put it back int the garden bed because once the bell rang there would be a lot of children walking there and they might not see the worm and end up stepping on it. She returned the worm to its "home" and we walked a few more steps. And she saw another one. Then another. And another. There were probably 10 worms in close proximity to where we were standing. "Mum- help me! I won't be able to save them all!" There was a bit of panic in her voice. We started picking them up. A friend and her daughter arrived and MissG organised the other little girl to help us too. We saved all the worms we could see just as the bell rang, but MissG still had to look around to see if there were anymore in need of help. Another time I've recently seen this spontaneous helping in action is when the kids are playing together on the Wii console. Obviously the older kids are more skilled at playing the games than the younger ones are. I have noticed that when the younger girls are struggling, and sometimes upset and frustrated with their level of success, that my 13 year old Autistic son will often respond by saying things like, "don't worry- you are doing well" or "this is a tricky level, I even find it hard, you probably just need more practice". He does his best to encourage them and help them feel better. If he feels like his efforts are not working he will often come to me and tell me that they are upset and need help. It is a wonderful thing to see your children show compassion for others and a desire to help when they can! In some ways even more so when you see it in your kids who have so much extra to deal with themselves!